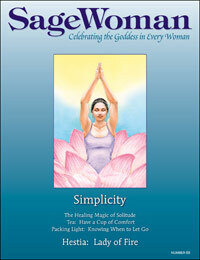 SageWoman #69 Simplicity (download) [sw069e] - $6.95 : BBI Media - Magazines that feed your soul. Simplicity is one of those qualities which everyone seems to admire, but nobody actually knows what to do with. Welcoming simplicity is about asking yourslef: “what is it that I want to remember about my life? What do I want to be remembered for?” Or, most poignant of all, perhaps, “whom do I wish to be remembered by?" This issue is filled with the stories of women who are searching — and often, happily, finding — the answers to these questions in their own hearts. We begin with "Simply Special: Building Temples for the Goddess," in which we visit the Goddess Temple of Orange County, an oasis of spiritual peace in the unlikely venue of a southern California office park. Then we travel to the Sierra Ancha Research station northeast of Phoenix, where a sojourn in solitude in a place of natural beauty brings healing from overwork and stress. The desire for a more simple way of living, and ways of incorporating simplicity into your spiritual practice is explored in "Simplicity as an act of worship" while the healing embrace of an ancient oak brings peace and comfort to a child in "The Listening Tree." Another solitary retreat — to the Connecticut shoreline — is the subject of "Packing Light" while "Tea: Have a Cup of Comfort" explores the momentary retreat we can bring into our busy day through the discipline of that most civilized habit of afternoon tea. Our columnists further connect our homes with the theme of simplicity: Diana Paxson introduces us the Mistress of Heath and Home, the classical Greco-Roman goddess Hestia (Vesta); herbalist Susun Weed teaches us the magick of common weeds; Kiva Rose describes the maidenly urge to walk to run wild; Lunaea Weatherstone introduces a column on the Queen archetype; and Stephanie Rose Bird describes communicating with spirits using water and fire. We round out the issue with a ritual for a pregnant woman starting a family; reviews of books by Margaret Starbird, Jean Shinoda Bolen, Diane Stein, and Donna Henes; and Rattle letters on endangered animals, the power of silence, and the place of crones in the Goddess community. All in all, this 96 page issue is a rich treasure trove of experience, wisdom, and quiet strength. Take care of yourself by adding this lovely issue to your collection. Published in Spring, 2006.